Many accident victims and their loved ones visit Lynn C. Harris of Jones Waldo given his record of legal excellence. Serving the greater Salt Lake City area, Mr. Harris is committed to victims, particularly when they are harmed as a result of another person or party's negligent actions. This is especially true regarding car accidents, which can cause life-altering and even fatal injuries. We want to focus on the nature of single-vehicle auto accidents, meaning motor vehicle collisions involving just one vehicle. As you're about to learn, the driver alone may not be the reason the accident happened. One common cause of single-vehicle auto accidents is bad weather. Whether it's rain, snow, sleet, or hail, bad weather will affect the traction on the road. If the surface of a road is wet or slippery, drivers are more likely to experience issues with handling that would not be an issue otherwise. In addition to bad weather, poor road conditions can also make driving hazardous. This applies to potholes and debris in the road, obviously, but this also applies to the general layout and design of a road as well. If a street narrows suddenly or there is a blind turn, this can lead to drivers losing control or needing to over-correct. Bad lighting and lack of signage on a road can similarly contribute to dangerous conditions. In addition to the above, it should be noted that a bad road can make poor weather even more hazardous for drivers. This is especially problematic if water pools on a road, increasing the risk of hydroplaning. Those who are responsible for the road and road maintenance should be held accountable for their actions in these cases given their failure to keep the road safe. Sometimes the vehicle itself or vehicle parts can lead to single-vehicle auto accidents. If the brakes on a vehicle fail, for example, this can lead to major problems with stopping time. Top-heavy vehicles such as SUVs may accidentally rollover or experience other major issues with handling and maneuverability. In such cases, the vehicle manufacturer or the parts manufacturer should be held liable for posing such dangers to drivers. 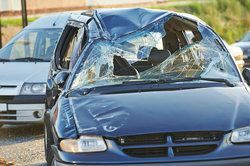 While the above are examples of single-vehicle auto accidents caused by external factors, we have to acknowledge that a number of these kinds of auto accidents may be the result of driver error. In such cases, speeding, distracted driving (e.g., texting or mobile device use), or reckless driving can all result in serious collisions. A major cause of many single-vehicle and multi-vehicle auto accidents is drunk driving. Alcohol impairs motor skills and affects your reaction time and cognitive abilities, making a drunk driver a major hazard on the road. Even if you are within the legal limit for BAC, you still may not be in any condition to drive. With that in mind, just remember: never drink and drive, and never allow your friends to drink and drive. Whenever an auto accident is the result of another person's negligence, having an attorney on your side is crucial for receiving just compensation. Your lawyer will help you receive compensation for medical bills and other losses, and he or she will also make sure that the negligent party is held accountable for their actions to ensure such accidents do not occur again in the future. If you or someone that you care about has been involved in a serious auto accident, it's of the utmost importance that you contact a personal injury lawyer today. Speak with Lynn C. Harris about your legal options in greater detail and learn more about your legal rights.